Located in Madrid, Spain within the Golden Triangle of Art region, the Museo Nacional Centro de Arte Reina Sofía, also known as the Queen Sofía Museum or El Reina, is the national museum of 20th-century Spanish art, named in honor of the country’s Queen Sofía. The building housing the Museo Nacional Centro de Arte Reina Sofía originally served as the first General Hospital of Madrid, constructed in 1805 under the order of King Ferdinand VI and designed by architects José de Hermosilla and Francisco Sabatini. Only one-third of the building campus designed by Sabatini was ever completed, though the hospital operated until 1969. Starting in 1980, the building was extensively renovated and converted into Madrid’s Centro de Arte complex. Two years later, the building was redesignated and dedicated as the Museo Nacional Centro de Arte Reina Sofía, in honor of Spain’s Queen Sofia. Though it was only opened to the public in part in 1988, it was decreed as the country’s national museum of 20th-century art by the Ministry of Culture later that year. Three glass circulation towers were added to the complex in 1989 by architect Ian Ritchie. In 2005, an 8,000-square-meter expansion was completed on the building at a cost of €92 million. The expansion, designed by French architect Jean Nouvel, added temporary exhibit space to the museum, along with 500-seat and 200-seat auditoriums, a bookstore, and several restaurants. 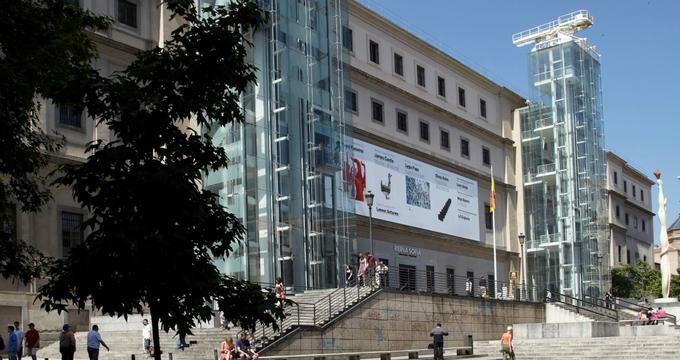 Today, the Museo Nacional Centro de Arte Reina Sofía is located within Madrid’s Golden Triangle of Art, which is housed within the Paseo del Prado and also features the Museo del Prado and the Museo Thyssen-Bornemisza. The museum serves as the country’s national museum of 20th-century art and is primarily focused on the work of Spanish artists. More than 21,000 works are contained within the museum’s collection, with most pieces catalogued and displayed on the museum’s website. The museum holds substantial collections of works by famed Spanish artists Pablo Picasso and Salvador Dalí, along with significant holdings by artists such as Joan Miró, Lucio Muñoz, Juan Gris, Pablo Serrano, and Antoni Tàpies. Works by international artists are also highlighted, including Diego Rivera, Vasily Kandinsky, Francis Bacon, René Magritte, Nam June Paik, and Max Ernst. The museum’s works are divided into three primary collections, beginning with The Irruption of the Twentieth Century: Utopias and Conflicts, which showcases works created between 1900 and 1945. The collection spans notable Cubist, Dadaist, and Surrealist works and examines the conflicting ideologies of modernity and the role of avant-garde artwork in interpreting sociopolitical and cultural topics. The works of Pablo Picasso are highlighted throughout the collection, including his famous masterpiece Guernica. In the Is the War Over: Art in a Divided World exhibit, the postwar period up to 1968 is chronicled, examining the role of mid-century consumer society and the Cold War conflict between the United States and the Soviet Union in shaping the artistic climate. The museum’s third major collection, From the Revolt to Postmodernity, looks at the impacts of social and political movements such as feminist movements and decolonization efforts on art and popular culture. In addition to major exhibition room collections, art pieces are displayed throughout the museum’s corridors, terraces, and squares, showcasing historic artists such as Alexander Calder and contemporary names such as Thomas Schütte and Rogelio López Cuenca. A mixture of Spanish and international artists are showcased in the museum’s temporary galleries, which elevate the museum as one of the largest and most comprehensive modern and contemporary art museums in the world. A Reina Sofía Museum Library is also offered for visitors, featuring a collection of more than 100,000 volumes, along with more than 3,500 sound recordings and 1,000 videos. Traditional market fare is served at Arzábal Restaurant, while brunch, tapas, and cocktails are offered at Cafeteria Restaurant NuBel. Guided tours of the museum are offered on a daily basis by museum docents without reservations. A variety of group tours may also be scheduled for small groups and organizations, including custom-themed tours for community groups and curriculum-incorporated field trip tours for school groups. Private visits may also be organized for groups, including corporate events. Educational programming offered at the museum includes workshops for children and families, programming for visitors with accessibility concerns, and museum training programs for the completion of university master’s art degrees. A variety of public special events are held at the museum throughout the year, including music, dance, and theatrical performances, film screenings, and seminars and conferences related to artistic topics.